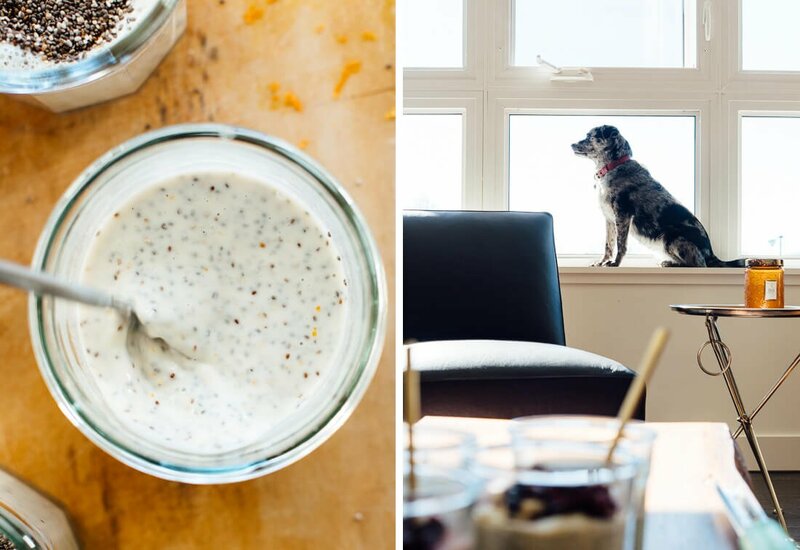 I’m sharing my new go-to breakfast recipe today—chia pudding. I’ve not been a big fan of chia puddings in the past (this creamy blended treat being the sole exception). This citrusy version completely changed my mind about chia pudding. This vanilla-orange chia pudding tastes like sunshine in a bowl. Now, I wake up craving chia seed pudding. Which is awesome, because I can make individual servings of chia pudding today, and enjoy them for the rest of the week. Breakfast is ready! 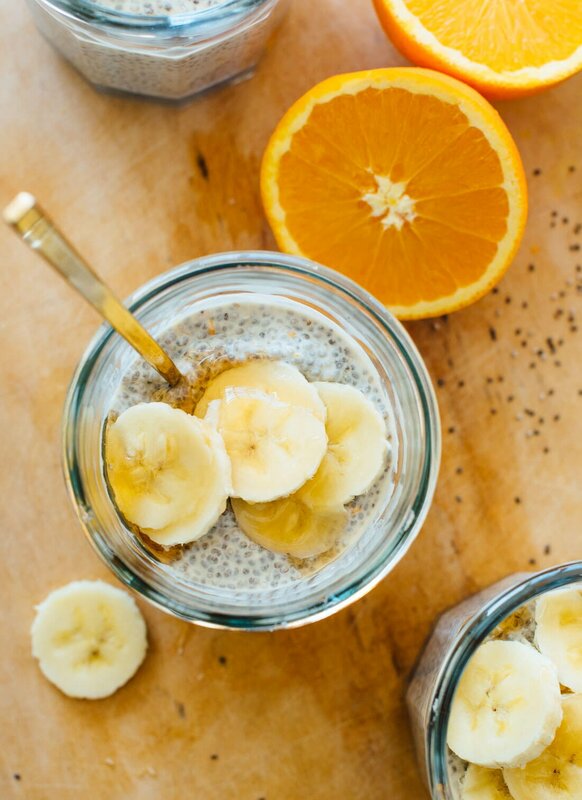 Fresh citrus, vanilla and honey are a perfect match for chia seeds. Especially when you’re using a base of creamy homemade cashew milk. 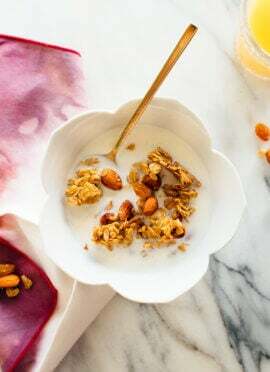 You can also use store-bought almond milk or coconut milk, but I really love the rich, neutral flavor and creamy texture that cashew milk provides. This easy recipe doesn’t require any cooking at all; it just needs an hour-long (or overnight) rest to give the chia seeds time to plump up. The resulting tapioca-like pudding tastes similar to a creamsicle or an orange julius. 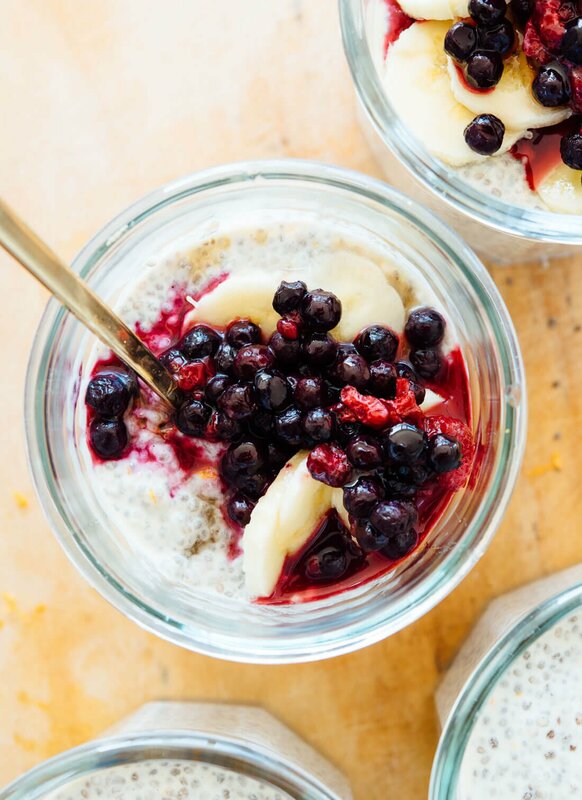 Enjoy this chia pudding for breakfast, dessert, or as a snack. It’s a creamy, filling, and healthy treat, no matter how you serve it. 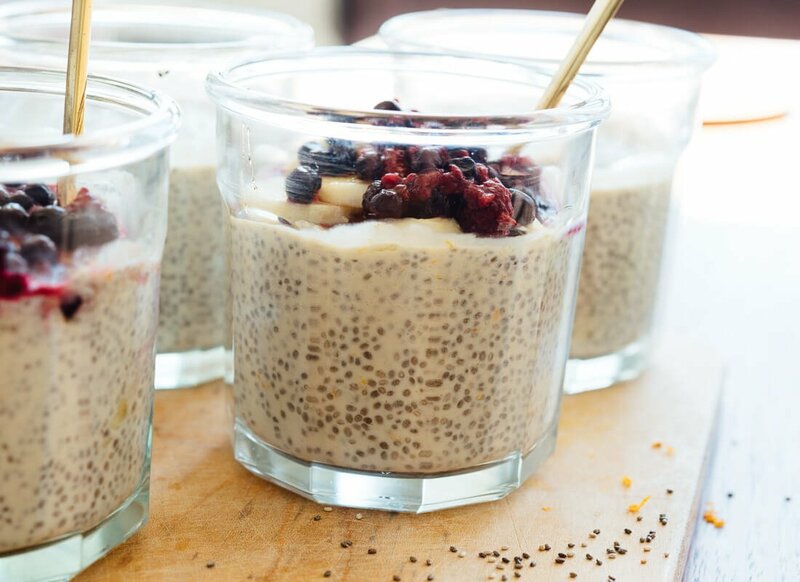 Chia seeds are high in fiber and Omega-3’s (Aztec warriors relied on them for energy), so this chia seed pudding will keep you going for a while! As always, please let me know how you like this recipe in the comments! Your feedback keeps me going, and your star ratings encourage other readers to give this recipe a try. Also, I owe you a follow-up on last month’s farmers’ market bowl. When I shared that I have been struggling this winter, I received so many thoughtful responses and heard from a lot of you who have been in the same boat. On your urging, I made an appointment with my doctor to check my iron, thyroid, vitamin B levels and so on—fortunately, all the results turned out normal. It seems I’m just seasonally affected. Solar-powered, if you will. If you’ve been feeling sluggish this winter, I recommend getting a dose of sunlight right when you wake up. Whether that’s by opening the bedroom blinds or eating breakfast next to a sunny window, I think it’ll help. I’m also trying to accept that different seasons offer different energies. Maybe I just operate a little slower in the winter, and that’s ok. Maybe you can relate. Breakfast helps me get going, I know that much! This creamy chia seed pudding recipe tastes like a creamsicle! You’re going to love this healthy gluten-free treat—enjoy as a snack, dessert or breakfast. Recipe yields 1 serving; multiply as necessary or see recipe notes for how to make 4 servings all together. In a small jar (these are perfect) or bowl, combine the milk, orange zest, and vanilla extract. Taste, and if you’d like a more pronounced vanilla flavor, add another ⅛ teaspoon vanilla extract. Be sure to measure out the extra vanilla extract rather than just pouring more in—it’s easy to go overboard. Whisk in the chia seeds, cover the bowl and refrigerate for at least 2 hours (or overnight), until the chia seeds have absorbed enough moisture to achieve a pudding-like state. 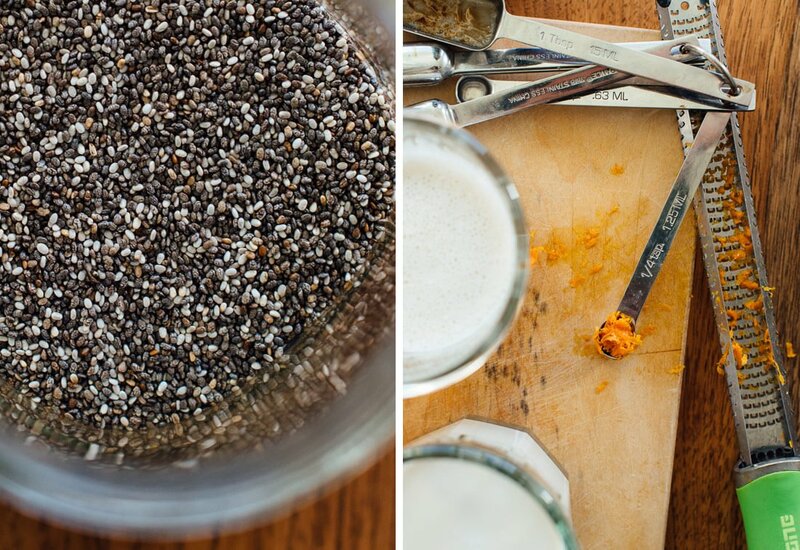 If you think of it, give it a stir sometime along the way to break up any clumps of chia. Before serving, stir once again to break up any clumps of chia seeds. Serve with a drizzle of honey or maple syrup on top and any additional toppings you might like. This pudding will keep well in the refrigerator, covered, for about 5 days. Make it vegan: Drizzle maple syrup on top instead of honey. Make it nut free: Use a nut-free milk, and don’t top with nuts. Change it up: I haven’t tried yet, but I bet this recipe would be tasty with other varieties of citrus zest as well. 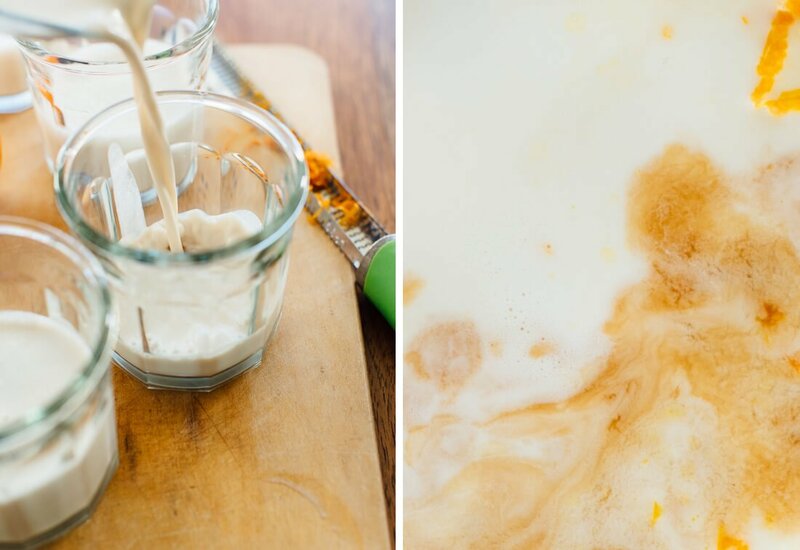 To make 4 servings at once: Combine 4 cups milk, 2 teaspoons orange zest and ½ teaspoon vanilla extract. Add up to ½ teaspoon more vanilla extract for a more pronounced vanilla flavor. Whisk in ¾ cup chia seeds and refrigerate overnight. Recipe update 3/15/17: My recipe originally included orange juice for extra orange flavor, however, it’s come to my attention that the acidity level of orange juice can prevent chia seeds from plumping up—this depends on the pH of the orange juice and the other liquid involved. I’ve edited the recipe from the original ¾ cup milk, ¼ cup orange juice, and ¼ teaspoon orange zest to the recipe you see above. It’s just as good and more reliable! My sincere apologies to anyone who had trouble with it before—what you see up there now is actually how I’d been making the pudding in the first place, and I’ve verified that it works with all of the milk options provided above. I had a combo of coconut milk and lime juice in the fridge now. I am excited to see how it turns out! That sounds delicious! Please let me know how it turns out! The flavors were great but it did not gel up with coconut milk as much as I had hoped. I will try again with less liquid next time. Thanks for the recipe. Thanks for updating, Laura. I hope the next time turns out a bit better. Hi Laura, I’m so sorry you had trouble. The recipe worked for me with orange juice and cashew milk, but I’ve learned since that the acidity present in citrus juice prevents the chia seeds from plumping up. I’ve removed the juice from the recipe, upped the amount of zest, and it should work with any variety of milk or citrus now. My apologies again for your trouble! For what it’s worth: having struggled with low mood from low light for years, I love and swear by my Phillips goLITE BLU. I sit in front of it for 10 minutes each morning (while catching up on email, reading, whatever, so long as your eyes are open) and that’s it. It has a great built in battery that I recharge about once per month, and it lasts for years and years. Not cheap, but it’s honestly made a huge difference in my life. It’s also super portable and easy to take on trips. Incidentally, it’s great for reprogramming yourself after changing time zones! Interesting that you would come up with getting a blast of sunshine when you wake up, to help with SAD. That’s exactly what the sleep doctor I’ve connected with recommends. Getting outside for 15 minutes is also highly recommended (weather permitting). This chia pudding sounds wonderful. I would add protein powder (I need higher amounts of protein to keep going), and I think it would make a great summer breakfast. 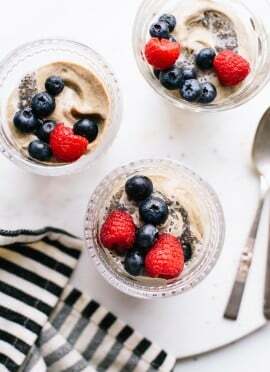 Just found this recipe and just had a question How long does the chia seed pudding keep, could you make a batch to last the week on a Sunday or do you have to make it fresh each night? Melissa, Kate mentions in the article that the pudding will keep for 5 days in the fridge. I hope you do, Alexandra! I tried this exactly as written and although the taste was great it never properly gelled up. I had to drink it. I am not sure if different chia seeds behave differently or maybe I should just decrease the liquid portion. Will try again as the taste is very good. Hi, Veronica. Sorry this didn’t work out as well for you! What kind of milk were you using for this? I’ve been hearing some mixed results with coconut milk. Veronica, I’m so sorry it didn’t work for you. It worked well for me with cashew milk, but I’ve learned from you and other commenters that the acidity level of the orange juice can prevent the chia seeds from plumping up. So, I’ve removed the orange juice and upped the zest and it’s just as tasty, and super reliable now! I’ve used the coconut milk mixture and just changed the ratio to 1 1/2 c milk and 5 tbs chia. It worked great and gelled up after a couple hours. It is delicious!!! I love that you post easy breakfast recipes! I’m going to have to try this one. It sounds tasty. :) I wish that you had a tab for lunch. I have a hard time coming up with quick, healthy lunch recipes to feed us and whichever grandparent comes over on the weekend to see my daughter. Tried this recipe today with coconut milk. YUM! It wasn’t completely thickened after an hour but I stirred it a few times before serving and that helped distribute the plumped up chia seeds. I added flaked coconut and sectioned oranges on top. So good! My four year old and two year old really liked it too. I have made your recipe, but I put all the ingredients together in a high speed blender so that the chia seeds are crushed! I dont like the grainy slimy texture of soaked chia seeds and so I’ve tried a chia chocolate pudding recipe from Detoxinista in which the chia seeds are crushed with a Blender and I found it delicious! And it is the same with your recipe: delicious! The perfect breakfast for me! Thank so much for the inspiration! Thanks, Martina! That’s a great tip for those readers who are gelatin-averse. I just today made my first batch of chia pudding in months. I forgot how much I loved it! This recipe looks great I’ll have to try it soon! I hope you do, Annie! Since going vegan I´m absolutely addicted to vegan recipes, and this is one my new favourites. Thank you for taking the time to share, I´ll be sure to check out more recipes from your blog. If you are ever in Tulum, Mexico and want to know the best restaurants to get vegan food, drop me a line. I made this last night and put it in the frig to gel for breakfast this morning. While the flavor was wonderful like a creamsicle it never thickened. Tips? I used all the same ingredients except almond milk versus cashew. Thanks! Hi Lisa, I am so sorry it didn’t work out for you! I’ve been investigating the issue and I figured it out—while it worked for me several times as originally written, the acidity level of the orange juice can prevent the chia seeds from plumping up. So, I’ve removed the orange juice and upped the zest and it’s just as tasty, and super reliable now. Again, I’m so sorry you were disappointed by this one; I don’t ever want to let my readers down! It wasn’t a disappointment. I appreciate your revision and your recipes. Thank you from one Kansas Citian to another. Have a good day! The acidic component instead of the milk (I use a cashew/coconut milk combo all the time) is probably the culprit disrupting the gel of the chia seeds. Perhaps hydrating the seeds in milk for an hour, then adding the acid (citrus juice) will provide the gelled citrus-y pudding treat we’re looking for. Based on Debbie’s comment, I let the seeds sit in regular milk for a while before adding the OJ and I had better results than some of the posters, but the concoction still wasn’t as pudding-like as when I tried a different chia pudding (with the same kind of milk) in the past. The flavors are nice, but I’m struggling with that texture! Hi Emily, I’m sorry that happened! I’ve revised the recipe—no more orange juice, just extra zest, and it has gelled marvelously for me with cashew milk, almond milk, and coconut milk. I hope it works great for you next time. Debbie, thank you so much for that clue. You’re right! I’ve removed the orange juice and upped the zest and it’s just as tasty, and super reliable now! Kate – your revision hits the mark! Delicious! Bummer! I was really looking forward to serving this delicious looking recipe to my family this morning. However I too followed the recipe to a T and yet my putting never gelled. I used almond milk. Rachel, I’m so bummed this recipe didn’t work for you! I have finally figured it out—the acidity level of the orange juice can be too high, and it’ll prevent the chia seeds from plumping up. I’ve removed the orange juice and upped the zest and it has worked like a charm for me in multiple re-tests. Well I made this yesterday morning so it’s now been in the fridge for about 36 hrs and it’s still not like pudding, sill a liquid. I made it exactly as the recipe described. I used coconut milk and everything else was the same. Any ideas why it won’t set up? I see a few others have the same problem using coconut milk. Michael, I’m so bummed to hear that! Mystified, too, since I’ve had good luck with coconut milk. I want to figure out what’s happening here. What kind of coconut milk did you use? Canned? Light or regular? I can see regular coconut milk potentially causing problems since it can solidify at cold temperatures, but it sounds like yours is still a liquid so I’m not sure that’s the problem. Thanks for the reply Kate, I used Silk unsweetened coconut milk, the refrigerated one. I ended up adding a scoop of whey protein powder and a banana and some cashews to try and thicken it up and blended it. Still could’ve used a straw to drink it. It did stiffen up a bit but not pudding like. Maybe I’ll try it again with can coconut milk and see how that does. Are you using the can milk? Hi Michael, I’m sorry for the delay. I’ve been investigating this issue and finally figured it out! The acidity level of the orange juice can prevent the chia seeds from plumping up (although it didn’t for me with cashew juice, must have been some weak orange juice). So, I’ve removed the orange juice and upped the zest and it’s just as tasty, and super reliable now! I think we’re on the same page! I’ve been feeling “seasonally affected”, too. And yesterday, before I read this post, I made creamsicle smoothies for my kids for breakfast. I used whole oranges that I peeled and seeded, unsweetened vanilla almond milk, and frozen pineapple. It was delicious and now that I’m into the orange-vanilla taste, I’m going to try this recipe. I also won’t have a bulky blender to wash… Thanks! While I do love your recipe creations, a good part of the reason I also come to your blog is to hear your thoughts and funny anecdotes. I am sorry to hear that you’ve been having a bit of a down winter. I live in Southern California so I get a pretty good amount of sun over here. I’d even say 3/4 of the year is almost unpleasantly hot! I get excited about the days that there is a bit of overcast or some rain because it’s a nice change. I admit, I might feel differently if I lived in another area. Despite my liking of chilly, sunless days, I know exactly what you mean about getting that sunshine in first thing in the morning! If I wake up to overcast skies, I have a hard time knowing WHEN my day is going to begin. I usually use the sun as a marker of time and without it, I’m a bit thrown off. A few days ago, I made a smoothie bowl for myself and sat down right next to the glass sliding door in my house where strong rays of sunlight come through. I have never done that before but it felt quite nice to eat breakfast and feel the morning sunshine on my face. I tried the recipe using Silk soymilk and topped it with a drizzle of maple syrup. While it was delicious, the consistency was much runnier than I expected. I’ll try it again with some other milk and see if the results are different. Should it have been thicker? I let it rest overnight in the fridge. Hi Lindel, I’m so sorry this recipe didn’t turn out as you expected. It kills me when that happens! I’ve figured out the issue—the orange juice can cause problems. I’ve removed the orange juice and upped the zest and it’s just as tasty, and super reliable now! Emily, thank you so much for that link. It led me on a science experiment with liquids of varying pH levels and chia seeds—you’re totally right, chia seeds don’t plump up in acidic liquids. I’ve removed the orange juice and upped the zest and the pudding is just as tasty, and the recipe is super reliable now! I have been lukewarm about chia seed pudding UNTIL NOW. This orange-flavored pudding with homemade cashew milk (a first for me) is fantastic! The orange makes it so fresh and light. A real winner. Thank you. The cashew milk. Which was kind of a revelation to me as well-new to the vegan nut milk stuff. This was really delicious. Gelled perfectly. The vanilla is perfect with cinnamon and orange. Thank you! Great! What type of milk did you end up using? I tried to make this recipe over the weekend with almond milk, and it never really gelled (was just like milk wish some gelatinous chia seeds in it). I even left it over night. Has anyone else encountered this issue? Should I use more chia seeds? Sorry! I see that many other people did have this problem. I wonder if you just have to try many different kinds of milk? Amanda, I’m so bummed the recipe didn’t work perfectly for you! After some experimentation, I learned that the acidity level of the orange juice can prevent the chia seeds from plumping up. So, I’ve removed the orange juice and upped the zest and it’s just as tasty, and super reliable now! Are you also taking magnesium? Vitamin D supplements will deplete your body of magnesium, so you should be taking that as well. I don’t know why, but a lot of doctors don’t even bring it up. The Vitamin D Council website has a lot of great info. My level was 12 ng/ml, which is VERY low. I have to take 50,000 IU’s each week along with magnesium (I drink CALM). I’m not completely back to normal yet, but I’m feeling so much better. Sorry for the delayed response! That’s so interesting. I’ve heard good things about CALM and will add some to my list! Thanks, Angela! I have become a little bit addicted to this pudding. I go a tiny bit heavier on the orange juice, and use vanilla soy milk. I make it the night before, and then have a delicious breakfast waiting for me to enjoy in the midst of a hectic morning. Thank you for the recipe! Oh, and even though I’m using a little bit more orange juice (I just squeeze the whole orange, rather than limiting to 1/4 cup), I have not had a problem with getting a nice gelled pudding consistency. Maybe the vanilla soy milk helps? You’re welcome, Nafija! I’m so glad it worked out well for you. I am a new fan of Cookie + Kate. I have tried a few recipes and all have been house favorites. I love My Favorite Chia Seed Pudding. Making the four serving size works best for me, just as it is written. I have made mine while prepping dinner and it is best on the second morning. The first morning it is too watery still. Since it stays fresh for a couple of days it is perfect on the second day. I think it just needs more time to gel than the recipe calls for. Can’t live without it now…thank you Kate! This will be the next article on my blog, a must share. Thank you, Cindy! I’m so glad this helps you start the mornings off right. Have you come up with a solution for using almond milk in your chia seed pudding? Hi William! I have. I just updated the recipe for it. Please let me know how the pudding turns out for you! Hi kate tried the chia pudding and really liked it! Have shared it with family and it’s a hit so I’m getting requests to make more. I did use extra vanilla. I’ve made it using store bought almond and coconut milk and haven’t found a lot of difference taste wise. Thanks for this recipe. It will stay on high rotation. So easy and so good. I used 3 drops of Fiori di Sicilia in place of the vanilla and added a splash of maple syrup in the morning. Yes! Way to fancy this up with the Fiori di Sicilia. It sounds like a delicious combination. I hope you do, Sasha! Kate is right – this tastes exactly like an orange creamsicle! I used a store-bought blend of almond milk & coconut milk but otherwise made this exactly as written. I topped mine with a small banana. Delicious! This high-protein meal is a great breakfast or dessert. I think next time I’ll make it the single serving but divide it in half; this is very filling for me, especially with the addition of fruit. I’m so glad you liked this, April! I think it’s a perfectly sweet, creamy treat. I see that a lot of the comments said that the pudding didn’t gel properly and I had the same issue. I used almond milk (no juice). But, I decided to add another tablespoon of chia seeds to the mixture (so a total of 4 tbsp in 1 cup of almond milk) and it gelled great after that, so it may just be a matter of having enough chia seeds for whatever liquid you are using. It was delicious but not as filling as I would have liked! Thanks for the tip, Debbie! 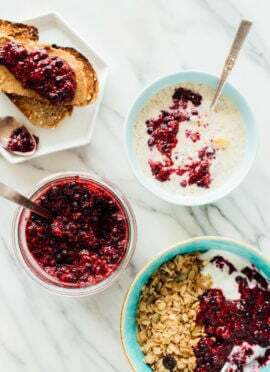 And yep, this one is more of a light snack, but you could always pair it with granola and some fresh fruit for something a little more substantial. I just made this over the weekend, and I now realize I should’ve asked what an ideal consistency for this pudding is. Mine certainly wasn’t soupy, but it was far from something like Greek yogurt or mousse. I used the amounts called for (but barely any maple syrup/sweeter, and no fruit, which I will add next time), so I think the consistency is correct — I’m just curious! That sounds right, Claire! It’s not going to thicken up like a mousse or yogurt will, but it should be gelled and creamy. Love the recipe and can’t wait to try! Do you think you could add vanilla or chocolate protein powder to up the protein? I haven’t tried it myself, SJ, but I don’t see why not! I’d keep an eye on the moisture level, because the powder will soak a lot of that up. Let me know how it goes! It worked! I used 30g vanilla protein powder and left out the vanilla essence but I shook the almond milk and protein powder first and then added everything else in. I had to add a little milk but it was lovely! Must try! I went to make this and was out of vanilla extract so I used lemon extract instead. It was delicious with blueberries! That sounds like a great combination, Jessica! Thanks! I love this website and purchased your cookbook. So far we have made maybe 10 of your recipes and everything has been delicious. I make this for breakfast often to take to work, it’s easy and yummy. Thank you for all of your hard work, I finally found a book that provides me with not just vegetarian foods but vegan and gluten free options. Thank you from Connecticut! This is such a kind comment, Lucy, thank you! I’m so glad you enjoy the book, too. This was the best chia seed pudding I’ve had! The orange zest is genius. My chia to almond milk ratio was off so I ended up adding more chia after the mixture had soaked overnight and it worked out fine. Thanks for a great recipe. Do you have any suggestions for lowering the fat content? Hi! Using store-bought almond milk will be lighter in fat and calories, but not quite as tasty or creamy, in my opinion. Chia seeds are high in Omega-3’s, hence the fat content. Excellent recipe and great tasting! I was skeptical at first but this is a great recipe and I’ve made it 2 times in one week! I am already thinking of other fruits to use (apple, cinnamon perhaps?). Thanks Kate for sharing! Love your site and your recipes! I think apples and cinnamon are a wonderful combination. You’re very welcome! Enjoy, Dianne. This was delicious! I zested a whole orange for extra yumminess and did 1/4 tsp vanilla and coconut chips! This was my first time making chia pudding! Thx for the recipe!!! I used almond milk and even after leaving it in the fridge overnight it still did not solidify. Too bad but thanks for sharing! Excellent. The original liquid:chia seeds proportion did not work for me– it never firmed up, even after a couple days. No worries, though– I have a huge bag of chia seeds and plenty of oat milk (for me) and regular milk (for the toddler). The proportion of Liquid:Chia that worked was 1/2 cup milk:2.5 TBSP chia seeds, and I got that from the Nutiva Chia Seed website. My guess is that different chia seed brands might produce different results? Anyway, the addition of some orange zest and vanilla is lovely, and allows you to (almost) eliminate the need for sweetner. Makes for a nice, low sugar, breakfast or snack! That’s interesting, Erin! I haven’t come across that yet. It could be the type of milk. I know it works well with cashew, almond, or coconut milk. I’m happy you found what works for you! I typically lean towards organic. Really any brand should work well. Enjoy, Whitney! I would love to hear what you think. If you have chai teabags handy, let one sit in boiled water for a couple of minutes, subtract a tablespoon of milk from your recipe and squeeze some liquid from the teabag into the mix. I did this last night and it turned out so good I had to come and share. This is delicious! This was my first try at a chia seed pudding, and needless to say, I am hooked! I’ve been having this a few times a week for at least a month now! I love the combination of orange and vanilla, truly delicious. Made this last night with agave syrup. Today, my wife and I had one serving with blueberries and a second later on with bananas. VI might try again with honey next time to see the difference, but this was very good. I appreciate the review, James! I loved this! I loved the taste of orange that spread throughout the whole thing. It really was like eating sunshine from a bowl. I followed your recipe for cashew milk. I sprinkled the top of the pudding with pomegranate seeds because that is what I had. Thank you for the recipe. And I do love your blog. It reads very easily, and that is so important. Sunshine, I love that description! Thanks for the review, Azita. I couldn’t find an organic orange on my shopping trip. Do you think I’d be better off just using the juice of an orange instead of the zest, or would that change the flavor? You really want zest for this recipe. Of course, organic is preferred. But, it’s ok if you don’t have access. This one didn’t work out for me. I prepared it last night and in the morning all the chia seeds were clumped in the bottom of the jar and all liquid on top :-( Any suggestions? After my previous comment about this recipe not working out, I wasn’t going to throw it away, so I put it back in the fridge and this morning it was perfect! I think after mixing the ingredients you need to let it sit for maybe half an hour or so, so the chia seeds start to plump up and don’t just sink to the bottom. Mix again and put in the fridge overnight. I added maple syrup, cinnamon and bananas. It was delicious! The easiest breakfast recipe for someone who is always rushing out the door! Try to give it a stir sometime along the way to break up any clumps of chia. That should help! Great recipe! So many fun flavor combinations to try with it! One tip I have is to use half a cup of full fat coconut milk (like condensed milk but coconut) combined with half a cup of regular coconut or almond milk to get a creamier consistency. p.s thanks for the chia recipe! I’m glad you like the recipe! Thanks for sharing. It didn’t work out for me. I prepared it last night, using soy milk and in the morning all the chia seeds were clumped in the bottom and all milk on top… I think I should use half a cup of milk. I’m sorry to hear that! Try to give it a stir, and then let it set some more. That should help. Hi this recipe seems amazing. Just one question though. Would be alright if I used dairy milk? I reallyyy don’t like the taste of almond milk so the rest of the box just goes to waste. I haven’t tried it as I don’t like dairy milk(just the opposite, ha! ), but it should work. I suggest seeing what other readers suggest by taking a look through the comments. Could I substitute the milk for soy or oat milk? I’ve got a nut allergy so cashew, almond or coconut are all a no-go. Sure! One of those non-dairy milk should work well. This is delicious! It was the first recipe I ever tried for making chia pudding. Thank u for posting it! I’m excited you really like it, Danielle! Thanks for letting me know what you thought. Hi Kate! I made this with grapefruit zest last night because I ate all of my oranges, and it was fantastic! So perfect to throw in my bag and eat at the office. I used an old Bonne Maman jar I had lying around and it fit perfectly. Used 1/4 tsp vanilla and pinch of salt, topped with walnuts and maple almond butter. 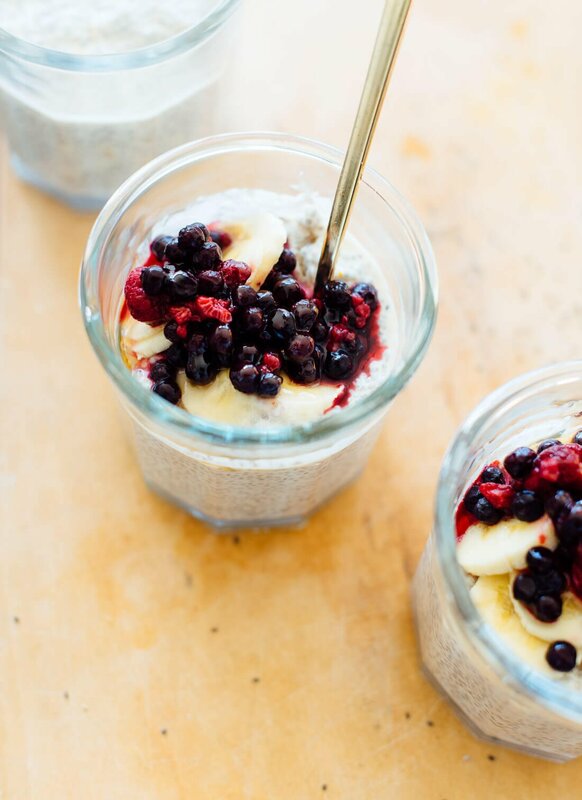 Thank you so much for this recipe, it’s now my favorite chia seed pudding too! Great to hear, Maria! Thanks for letting me know your variation and that you loved it. I LOVE this! It’s soooooo delicious. I am not a fan of maple syrup. I love this with honey and the orange zest! My husband and I are eating really healthy and vegetarian. I just love your blog so much. Most everything we make is from your website. Thank you, AJ! I’m glad you loved this one too. I love overnight chia! I use kefir as the soaking liquid, rather than nut milks. My first attempt ( using almond milk) and it was excellent. The orange flavor is refreshing. I topped it with slices of Bartley Pear. No sweetener needed. Thanks for sharing. This is now a favorite. You’re welcome! I’m excited it’s a favorite for you, Donna. I’ve just started making chia seed pudding. I can’t say I loved it the first few times, but it’s growing on me. Like others, I’ve found that sometimes the chia doesn’t get as thick as I’d like. I’ve found that mixing some plain non-fat Greek yogurt can make a world of difference. I’ve even tried making it with only yogurt – which resulted in a very thick creamy concoction full of protein. I haven’t tried cashew milk yet, so your recipe will be next. Thanks for sharing! Thanks for sticking with it and sharing what you have found works for you, Paula! A refreshing change to my chia routine! Thanks for the review, Melissa! Thank you! I actually had this once with OJ and much prefer it this way. The flavor was nice but consistency was runny. Either needs more chia seeds or less milk (I used unsweetened almond milk). I should have read the previous comments before making this! I’m sorry to hear you didn’t love it! How long did you leave it set?